All I want for Christmas is the ‘DeafGeoff’ poster from a Garbage Pail Kids tribute art show. Seriously. Gallery 1988 in Los Angeles hosted an awesome Garbage Pail Kids tribute art show in September. It consisted entirely of GPK-inspired art, including remakes and reinterpretations of the famous trading card set (and TV show, and movie) that grossly parodied Cabbage Patch Kids, with characters like “Adam Bomb” and “Dire Rita.” The Hundreds posted photos of the gallery’s opening, which featured celebrity guests like Hayley Williams from Paramore and Chad Gilbert from New Found Glory. My favorite was a piece by Ryan Brinkerhoff, an electro-inspired remake of “Deaf Geoff,” which was an actual Garbage Pail Kids trading card in 1986. (Yes, I have the card.) His design is similar to the original, showing a character literally blowing his ears out by blasting music from a boom box on his shoulder. But Brinkerhoff changes up the colors for a funky interpretation that would have looked cool on the walls of any ’80s dance club. It’s currently on sale as an 18″ x 24″ poster for $30 on the Gallery 1988 website. I want it. I want it for Christmas, my birthday, “just because,” whatever — and I’ll totally frame it and hang it in my apartment. It’s too awesome not to have it, especially since it’s a modern art twist on the GPK card inspired my namesake*. ***Final Update: Someone wonderful got me the poster. :) Thank you to everyone who offered. Happy holidays! *A few people have asked me over the years where I got my name “DeafGeoff,” and if it has anything to do with the Garbage Pail Kids card or the ’80s rapper Def Jef (who later produced Shaquille O’Neal’s first album). There’s also an obscure ’80s movie called ‘Plain Clothes’ (starring Arliss Howard, who played grown-up Scotty Smalls in ‘The Sandlot’) that had a character named Deaf Jeff, but my name came from none of those. No, I simply came up with the name myself when I was 12 years old — before I know about any of the other versions of the name — and made it my first screen name on AOL. It’s my DJ name, too, and it’s an easy introduction to the fact that my name is Geoff Herbert and I’m mostly deaf. 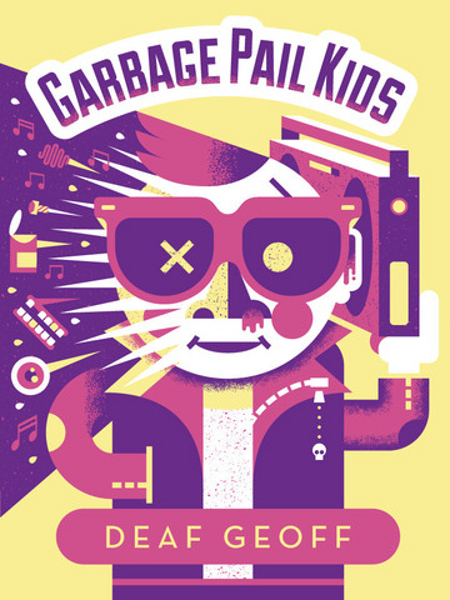 This entry was posted in Design, Pop Culture and tagged art, Deaf Geoff, deafgeoff, Gallery 1988, Garbage Pail Kids, Ryan Brinkerhoff by Geoff 'DeafGeoff' Herbert. Bookmark the permalink.